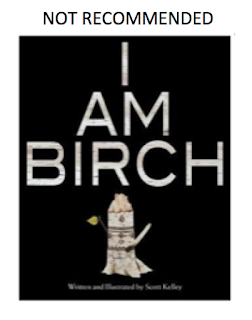 A colleague wrote to ask me about Scott Kelley's I Am Birch. Published in 2018 by Islandport Press, it is getting a 'not recommended' from me. The legends of Gluskap were part of artist Scott Kelley's childhood. One in particular, "How Rabbit Got Long Ears," was a favorite. In it, Rabbit tells the other animals that the sun is not going to rise again, and Gluskap must set the record straight. I am a former schoolteacher. Some people think books are just meant to entertain--but they definitely educate, too. What do students learn by reading I Am Birch? Given the illustrations (I've included several, below) and the information in the "About the Book" page, I Am Birch looks like it is a Native story. So, I would try to figure out a few things. The answer? No. Kelley isn't Native. Course, that doesn't mean he can't tell create words or illustrations that look like they're meant to be be Native, but when someone chooses to create content that they're putting forth as Native, they must do a lot of research, first. So, that's the second question. Does the author provide us with information about his research? Or, his resources? One of the touchstone articles about sources for is Betsy Hearne's Cite the Source. The answer? No. Nothing of that sort is listed in the book. I have no doubt that Scott Kelley meant well. 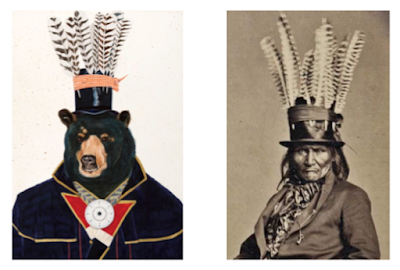 But the images of Indigenous people that most Americans carry around are deeply flawed. Knowing they're flawed is the first step. Becoming aware of the big and small ways they're flawed starts by doing research--not of standard sources--but of books written by the people they are writing about. Because Kelley's book is about the Wabanaki peoples, he could start by reading nonfiction by Lisa Brooks. She is Abenaki. Zooming out a bit, he could also read a book by an Indigenous scholar like Daniel Heath Justice. His Why Indigenous Literatures Matter is new and an outstanding resource about our literatures. Third: does the author give us anything at all to work with, in order for us to do a critical analysis of the content of their book? In the back of I Am Birch, there is an "About the Book" page. It has some words to guide our analysis, but it is pretty thin. First is "Gluskap." Someone, we're told on that page, who can "set the record straight." Ok--Gluskap is someone with power or influence. All four have websites that include links to pages about their histories, cultures, and their respective languages. As far as I've been able to see, none of them call their language Wabanaki and none of them refer to their tribal members as Wabanaki. And, these are distinct nations. In short, the "About" page gave bits of information that I used, below, when I started looking at the content of the book. Fourth: Does the author have a website that can help understand what they're doing with their book? Kelley does, in fact, have a website and there are several news articles about his book. In the "About" page, I read that Kelley was working on a series of paintings of Wabanaki tribal elders, I thought he meant that elders were sitting for portraits, but that's not the case. Turns out, Kelley is using old photographs to do his series. 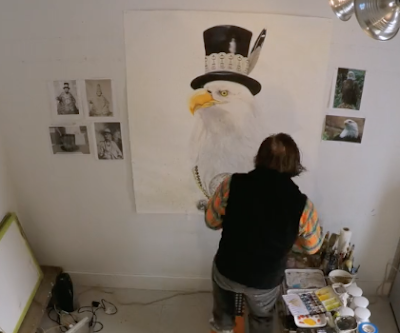 You can see his method in a video, Scott Kelley Studio Timelapse, where he's shown doing an eagle (the eagle in the video is not in his book). Figure 1 (below) is a screen cap from the video. In the center is his canvas. On the left are what he's calling "Wabanaki elders." On the right are photographs of eagles. Those photographs Kelley used are what helped me learn that he's not correct in saying "Wabanaki elders." At least one of the people in the photographs he used to create the illustrations in I Am Birch are not Wabanaki. In Figure 3 (below) I put a screen cap of his bear next to a screen cap of the Native man he used for the headdress he put on his bear. The photograph on the right is in the Massachusetts Historical Society's archive. 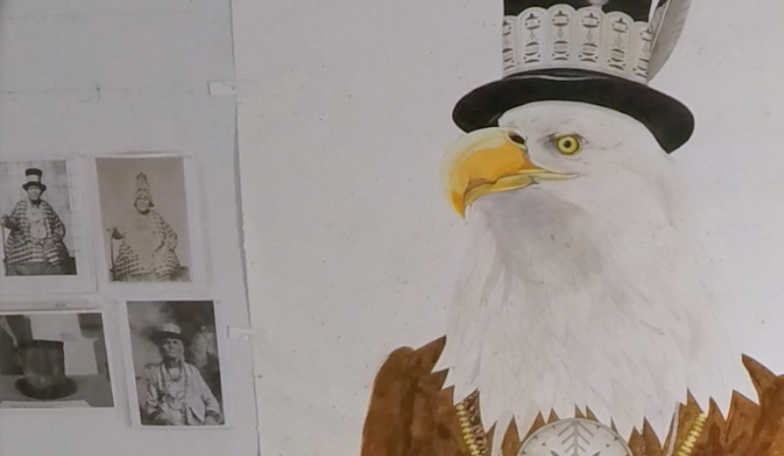 It is titled "An Ojibwe man in DC." Next, look at the photos below (Figure 4) of a Penobscot man and two different Penobscot women. The man is wearing a large collar draped around his shoulders. In the center photograph, a woman is wearing it. In The Handicrafts of the Modern Indians of Maine," (published in 1932), Fannie Hardy Eckstorm (she isn't Native) wrote that women "have no right to wear it [that collar]." Is she right? I don't know, but one thing is known: in some of these old photographs, the photographers would ask people to put on items of clothing that didn't belong to them to make the photograph seem more authentic. The first two photographs were taken by A. F. Orr. I don't know if he was among the photographers who asked people to wear this or that, even if it wasn't theirs. Is Kelley aware that he should be careful in using these old photographs? I haven't found who took the third photograph, of Molly Molasses. As I compare what I see on his website with what he put into his book, I see that Kelley combined aspects of those photographs to create his Badger. 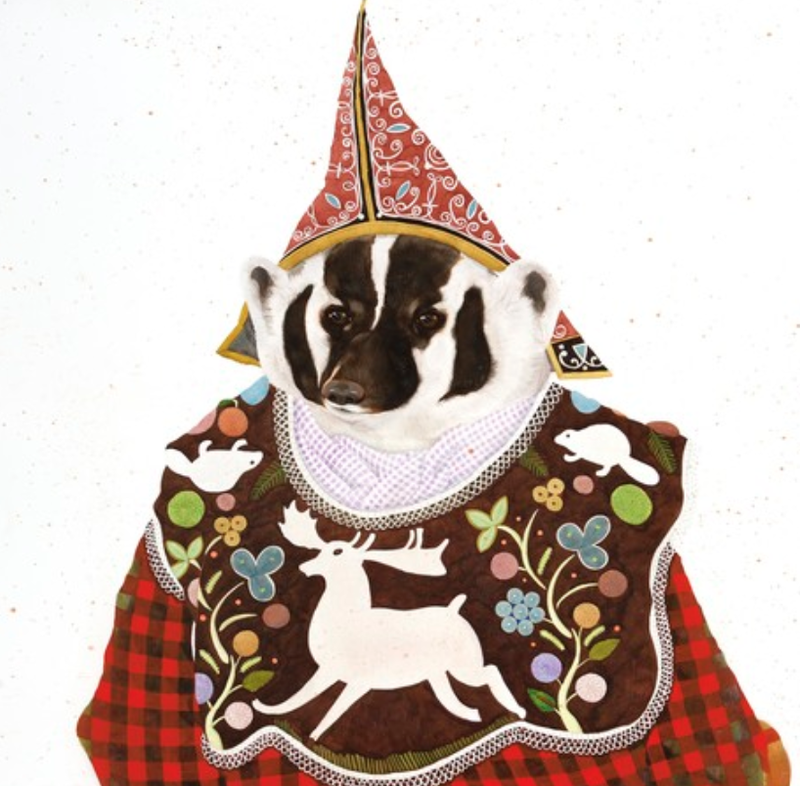 In his Badger (Figure 5), you see the collar, and the cap shown on Molly Molasses. The photo of Molasses doesn't show much detail on the cap, but online you can find detailed photographs of the caps. They were often made of red trading cloth. In his book, Kelley refers to his Badger as a female. If Eckstrom is correct about who can and cannot wear the collar, then it is incorrect for Kelley to put it on Badger. 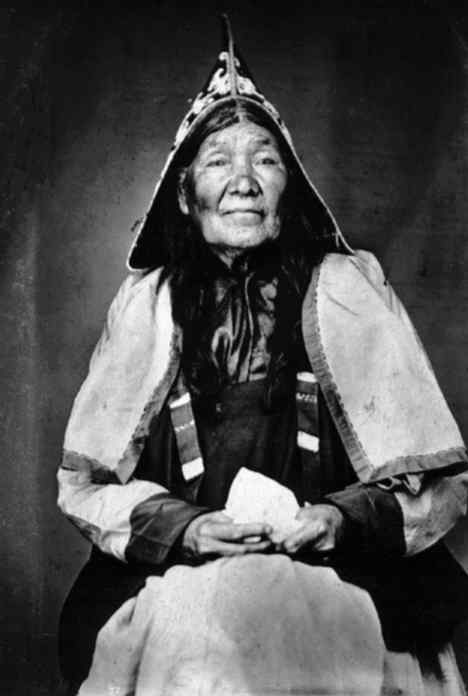 I think Kelley used a photograph of Molly Muise (Figure 7), who was Mi'kmaq, to make Deer's cap. Setting aside Kelley's art to look at the story in I Am Birch, the "About" page says that his story is inspired by "How Rabbit Got Long Ears." So far I have been unable to find any versions of that story. Searches of that story name take me to the "Native Languages" site--but those stories aren't sourced and some go to hokey sites. If you know where I can find it, please let me know. Kelley's story opens with "Everyone calls me BIRCH, for I am a birch tree, much like any other." Turning the page, however, we read that Birch is not a tree anymore because Beaver came along and turned Birch into a stump. Beaver was mumbling "COLD AND DARKNESS." After a while, Porcupine comes along and tells Birch that COLD AND DARKNESS are coming and that everyone is terrified. Birch asks Porcupine who told him about this COLD AND DARKNESS. Porcupine thinks it was Deer. When Deer comes by, Birch asks her if she was the one who started it, and she says she heard it from Badger. This goes on for several pages, with Kelley using photographs of animals in Kelley's versions of Native articles of clothing. Because Birch is the one who finally figures out there is no COLD AND DARKNESS coming that everyone should be afraid of, I think Birch is meant to be Gluskap. Kelley's Birch sets things right. In I Am Birch, some might find the art and the story compelling, and they might see it as a tribute to Indigenous people. But is it? I don't think so. 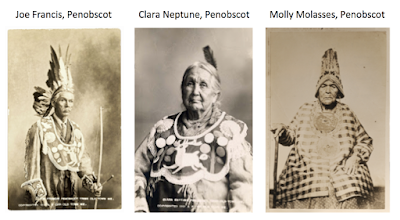 Kelley uses what he calls photographs of "Wabanaki elders" to create his characters, but those photographs are from distinct tribal nations--some of which aren't even Wabanaki. 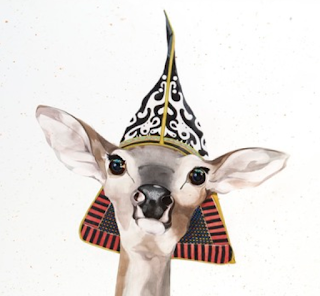 To some, his animals are pretty to look at, but this mish-mash treatment of different nations renders his art inaccurate. In creating this art, as he did, Kelley seems unaware of the need to be accurate and to do research to ensure accuracy. Generally speaking, people don't make up stories like the ones they read in the Bible and put them forth as Bible stories. They understand that is doing that is disrespectful and sacrilegious to Christians who deem those stories sacred. That fundamental respect must be accorded to the stories of Indigenous peoples, too. The Gluskap stories are not folktales. To the people who tell them, they are sacred, creation stories. In creating the story he tells in I Am Birch, I think Kelley is stepping over lines of respect. 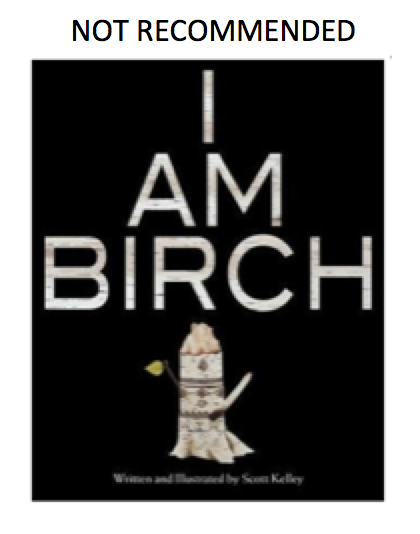 In short: I do not recommend Scott Kelley's I Am Birch, published in 2018 by IslandPort Press. Sometimes I think artists forget the responsibility we have with regards to the references we use---often photographs and pictures. Sometimes I think we also forget the power that pictures have: it's not enough that they look "pretty", all of our art always says something, so we have to take as much care with our art as a writer would with words. Unfortunately you get popular artists who teach that character design starts with stereotypical shorthand. "If I want to draw a villain, I want people to look at this person and realize they are evil, so I might give them scars, an obvious deformity, give them dark hair, just make them look *dark*. If they're a man, make them a fop; if they're a woman, make them too man-like. Also a large crooked nose." And these artists (almost always white, gender-conforming, and very likely gentile) just teach their students this and don't examine what their art is saying, and what their students' art will say. See also: Disney movies up until recently. I have many feelings about using animals in place of people, or monsters in place of people, to represent marginalized people. Some artists do this to avoid being accused of racist imagery, because they see other artists being taken to task for whitening a character's skin when that character is dark-skinned. So the thinking goes: "if I use animals, nobody can accuse me of this!" Then they screw it up in other ways because they think they've taken the need for care out of the equation. Oh, yes: and references. References can get an artist in trouble if they use the wrong ones, or use references for which they haven't researched the context for, or decide not to use references for something they don't know how to draw. Sometimes this is OK, like drawing a bird in a tree that isn't expected to be a scientific or historical illustration, so you don't have to match bird to tree type. And this is definitely not OK if you are using human elements, especially human elements associated with historical fashion, even if you're putting them on animals. Art is as impactful as words, and sometimes moreso: for good or for ill. It would be a much better world if more artists recognized this fact, and took that responsibility seriously. Especially if they're creating media that will be read/watched/listened to by children. I have a lot to say about how visual art is devalued as a medium of meaning and message through how it's treated by "serious art connoisseurs" who do their best to divide meaning away from "artfulness"---a practice that carries on today even outside of art schools. But despite this devaluing, art still delivers meaning, as all mediums do, even if it does it subconsciously. It's even more dangerous because people don't realize the power that art has. I think the comparison to Bible stories can't happen often enough. Too many people don't think of the stories as having special significance to the people involved. What a mess, Debbie! Thanks for your careful research. I seem to remember several versions of the Rabbit’s Ears story. I also seem to remember that Joe Bruchac (Abenaki) told a version of How Rabbit got Long Ears; it could possibly be found in Michael J. Caduto and Joseph Bruchac, KEEPERS OF THE ANIMALS: NATIVE AMERICAN STORIES AND WILDLIFE ACTIVITIES FOR CHILDREN. Or maybe I heard it in one of Joe’s audio tellings. Next time I go to the library, I’ll look for it.